A hollow groove is filled with colorful harmonious guitar play as we sink into the plush melodies of Crossing Willow Creek’s opening track “Can’t Go Back.” Bill Abernathy’s latest record doesn’t waste any time laying out a gentle jam before our ears and captivating us with its complex beat, which struts with a swagger that was only hinted at in his last album Find A Way. Introspection is a big part of what makes this LP feel so intimate and emotional, and the first song is one of the more vulnerable moments in the record. It’s complimented by the following track “Changes,” which augments the country style sway of the opener into an all-out rock powerhouse. 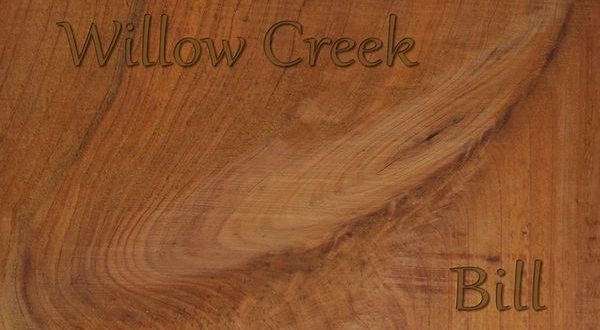 “Willow Creek” evens out the terrain a little with its shimmering guitar licks that bounce off of one another, and as we transition into the menacing dirge of “Cry Wolf” one thing becomes most definitely certain. Bill Abernathy is among America’s most skilled unsung folk music heroes at the moment, and his new album does everything it can to break down the enigma surrounding his craftsmanship and bolster the many talents of its multidimensional star without sacrificing any of his acrylic tone. “Cry Wolf” is as bluesy as Abernathy has been willing to go as a songwriter, but it’s not a far stretch from the bucolic acoustic tunes that it’s accompanied by in this record. The blunt disdain for corruption referenced in the lyrics essentially makes it a more rebellious song than any of the others here (save for “Yuppie Blues”), and it stands out as one of the more energetic and surreally appointed tracks I’ve heard in the whole of his growing discography. The volatility of the structure crumbles as we move onto “Meant to Be” and then the bold southern rock warhorse “Whiskey Road,” which is propelled by a molten hot lead guitar that bonds to the leathery, road-word vocals exquisitely. Even when Abernathy is being as rough and tumble as he can be in the studio, the mix never lets his inner wild child take over the controls behind the glass. This is an overstuffed bag of uniquely American folk-rock ballads and brawlers, but the mere notion of it being inaccessible to the average music aficionado is, frankly, laughable to say the least. This is the Bill Abernathy record I wanted to hear this year, and its illustration of the Kansas City-based songwriter is one that his fans – both old and new – will be quite satisfied with.